Unlike its rival game console makers, Nintendo has never really tried to sell the Wii U as a streaming-video powerhouse. Sure, it has obligatory apps for Netflix, Amazon, Hulu, and YouTube; and it added anime service Crunchyroll last December, but Nintendo has otherwise seemed oblivious to the explosion of streaming-video options on other platforms. Services such as Sling TV, HBO Now, Crackle, Pluto.TV, and Plex are absent from Nintendo’s console. All the stranger, then, that the Wii U’s sixth-ever streaming-video app is one you might have never heard of. It’s called Watchup, and it acts as a kind of automated news channel. You tell the app which topics and news sources you like, and it strings together a daily newscast from short video clips. Watchup’s Wii U app is tailor-made for the console, with the GamePad serving as a fancy touchscreen remote. 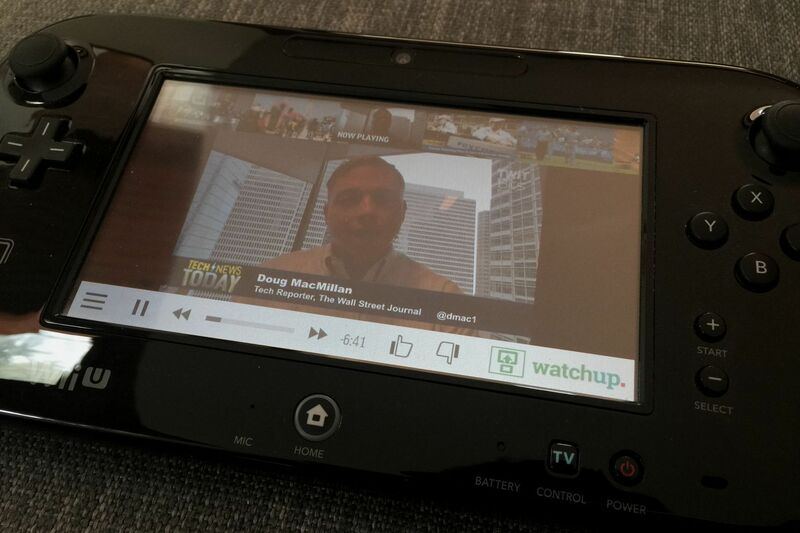 How did WatchUp become part of the Wii U streaming video catalog? According to Watchup founder and CEO Adriano Farano, Nintendo asked for it, seeking to fill a specific gap in its lineup. While gaming is clearly the focus at Nintendo, Farano said the Wii U has a “pretty engaged audience” of people who use the console for video, and presumably don’t have cable TV. (Farano declined to give hard numbers, saying he wasn’t allowed to share Nintendo’s proprietary data.) 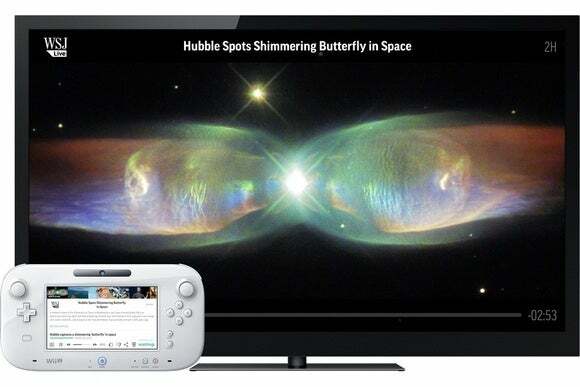 After looking into the platform, and seeing that Watchup would have virtually no competition for streaming news, the startup began working on its Wii U app around the beginning of this year. “We did our math, and we realized that there was a true opportunity there,” Farano says. Watchup and the Wii U do seem like they were made for each other. When you launch Watchup for the first time, you use the GamePad’s touch screen to choose a few favorite topics and media outlets, such as NBC, PBS NewsHour, the Wall Street Journal, and the Economist. You can also plug in a zip code to get news from your local channels, provided they post their video clips on the web. The Wii U’s GamePad provides playback controls and a description of the current story. After setup, a newscast immediately starts playing on the television. Meanwhile, the GamePad shows a text description of the current story, thumbnail previews of upcoming stories, and playback controls. You can also give a thumbs up or down to the current story to help tweak Watchup’s algorithms, or jump to a specific topic or news outlet. You don’t need the GamePad’s screen to use Watchup—everything can be controlled directly on the television with a secondary Wii U control—but it helps. And if someone else wants to use the TV, you can instantly toggle the video to play on the GamePad’s screen instead. Pressing a button on the GamePad instantly switches video to the small screen. What’s less clear is whether people will notice. Farano mentioned some possible promotional support from Nintendo, along with its own marketing efforts, but for now, finding Watchup involves scrolling to the “video on demand” section at the bottom of the eShop. Chances are, people aren’t accustomed to doing that, given how infrequently the Wii U has added any new video apps. And unlike Netflix or Hulu, Watchup probably isn’t something that huge numbers of people are seeking out. The launch doesn’t appear to be part of any renewed video push by Nintendo, though Netflix’s Wii U app did get a redesign recently. Still, Farano is optimistic about Watchup’s Wii U app compared to its other TV apps on Xbox 360 and Amazon Fire TV, though he wouldn’t get into numbers. “People spend more time on the bigger screen than on the smaller, just because the experience is more immersive, and we think that with the Wii U, we're going to see pretty similar levels of engagement,” Farano said. 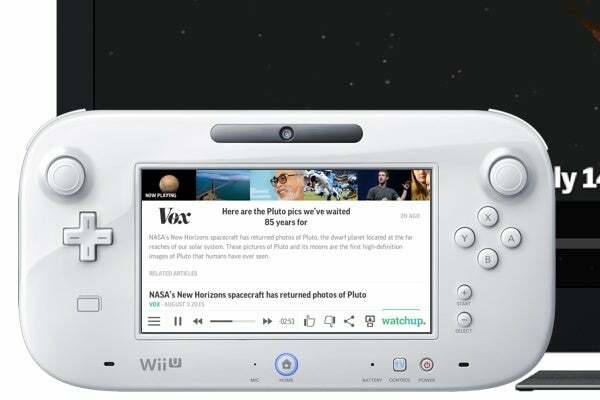 Farano also hopes Watchup can apply its work on the Wii U to other platforms in the future. He mentioned Apple TV specifically—it’s already possible to beam video from Watchup’s iOS app to Apple TV via AirPlay—though Chromecast also seems like a good fit with its interplay between the phone and TV screen. “As we design our roadmap, we are always on the hunt where the Watchup experience can make a ton of sense,” Farano said. He wouldn’t say for sure, however, if Watchup might appear on whatever console Nintendo is working on next.